50 Trainers have accounted for nearly 72% of all Keeneland wins. It’s time you know how they did it! If you handicap the races at Keeneland, then understanding the tendencies of the trainers is paramount to success. Keeneland Winning Trainer Patterns for 2013 is based on the extensive database of handicapper and author Art Parker, a regular contributor here on Agameofskill.com. It’s bigger and better than ever with no less than 110 winning trainers profiled! 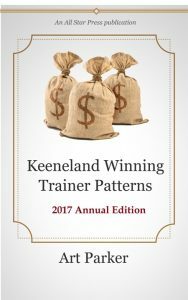 In this unique trainer guide, Parker analyzes the winning patterns of the most successful horsemen that race at Keeneland. With this data right at your fingertips, you will know the winning tendencies of each and every trainer that has saddled multiple winners at Keenland over the past 7 race meets. 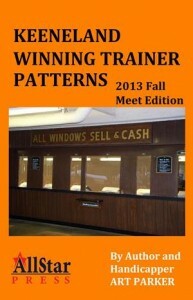 The 2013 Fall Meet Edition of “Keeneland Winning Trainer Patterns” is now available from publisher All Star Press. We’ve put trainers, Keeneland, and the past 7 meetings together (3 1/2 years) to try and have the best results possible for the upcoming fall meet, 2013. Our focus is on the trainers that do more than show up and win a race. We have detailed the individuals from the last seven meetings that were multiple winning trainers. In other words, a trainer had to collect at least two victories to be recognized. Just how good were the multiple winning trainers? Here are a few facts from 2010 – 13 that validate the importance of these successful trainers. Keeneland held 1,063 thoroughbred races collectively in the seven meets dating back to the spring of 2010. Trainers winning at least 2 races in these seven seasons totaled 111. The 111 multiple winners won a total of 960 races collectively or 90.30% of all races. Of the 111 multiple winners, 50 trainers won at least 5 races. 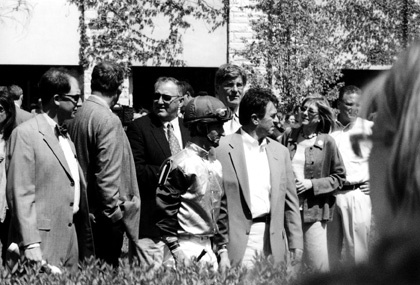 Those 50 trainers collected a total of 764 wins or 71.8% of all races. 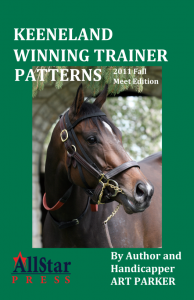 The details of all the winning trainers and their corresponding victories over the past 7 seasons at Keeneland are presented to handicappers in this book, Keeneland Winning Trainer Patterns. A one-of-a-kind publication. Only $9.97 now through PayPal. One ‘hit” will pay for this book 10x over. Download it today to any PC or Mobile Device! It would be a mistake to overlook some of the connections as far as owners are concerned when it comes to Keeneland racing. Trainers do not take their entire stables with them wherever they go, unless they are very small operations. Since purses are superb at Keeneland and since the meetings are short and prestigious, many owners are going to want to be there. Trainers play many roles as previously discussed and one of those roles is politician. A trainer does not want an unhappy owner because an owner controls the inventory of soldiers a trainer has for battle. Without horses a trainer cannot make a dime. 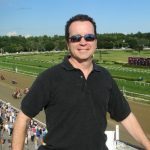 Many times an owner connection means nothing, but it is important to keep alert as a horseplayer owners can provide important clues to what is going on. Let’s take a look at some of the discoveries of the 2010 Keeneland Fall Meeting. There is no doubt you will see several, if not a majority of these in 2011. The biggest trainer name in America is Todd Pletcher. When you look into his barn one of the first things you notice are a couple of winning owners from last year that rings bells. Dogwood Stable and Overbrook Farm are Pletcher clients and they are a couple of the very elite names in American thoroughbred racing. Pletcher won for both of those last fall. Hall of Fame trainer Bill Mott continues to be around big money race meetings and he picked up a couple of winners last fall for Juddmonte Farms, an operation that has won many awards and made tons of money racing in America and Europe. Juddmonte is owned by Prince Khalid Abdullah of Saudi Arabia, and a member of the Saudi Arabian royal family. Wayne Catalano invaded Keeneland from Chicago and experienced much success. Catalano had multiple winners with owners Gary West and Talons Racing. There was a trio of trainers that recorded two wins for the same owner. 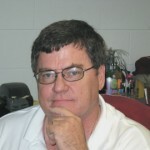 Tevis McCauley won a pair of races for Ron McCauley. Al Stall hit the winner’s circle twice and Columbine Stable was the winner of both. Jamie Ness won two races at Keeneland’s Fall Meeting for his client Midwest Thoroughbreds. Ken McPeek won a couple of races for Joseph Engelhart and a couple for Magdalena Racing. McPeek even had one winner with a horse the two owned together. The very talented Wesley Ward was co-owner of a runner that scored twice at the Keeneland Fall Meeting. His co-owner was Gatewood Bell. The 2011 Kentucky Derby winning trainer, Graham Motion, was successful at the Keeneland Fall Meeting last year. Motion won three races for Augustin Stable, and he did so using three different riders. 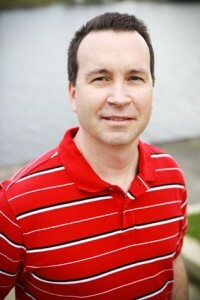 Mike Maker won four races for Kenneth & Sarah Ramsey. One of the victories was a first time claim and the other was a second time claim. Tom Proctor did a great job for his client Glen Hill Farm. One three consecutive days the trainer won a race for his owner and Garrett Gomez was aboard all three winners. Charles Lopresti won two races for owner Morton Fink with the same horse. Lopresti also scored three times for client Four D Stable. Green Lantern Stable had winning runners with George Arnold and Charles Lopresti; The duo of Kenneth & Sarah Ramsey had success with Mike Maker and Wesley Ward; The Augustin Stable had a successful fall meet with trainers Graham Motion and Jonathan Sheppard; and Courtlandt Farms enjoyed victories with Neil Howard and Bill Mott. Art Parker is the author of the newly released publication “Keeneland Winning Trainer Patterns – 2011 fall meet edition.” Learn the winning tendencies of the successful horsemen at Keeneland – click here for more details. 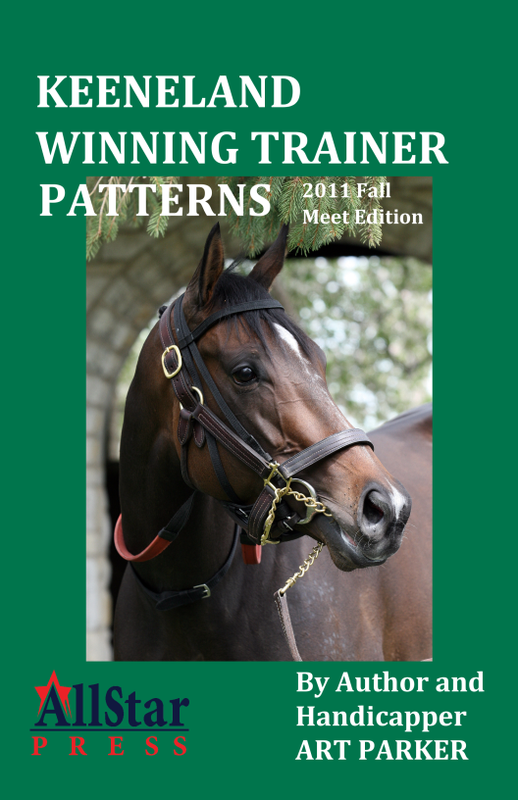 Learn the patterns of winning Keeneland trainers! Did you know that…Keeneland held 161 thoroughbred races on 17 days in the fall of 2010. Trainers winning at least 2 races totaled 28. The 28 multiple winners won a total of 110 races collectively or 68% of all races. Of the 28 multiple winners, 9 trainers won at least 5 races. Those 9 trainers collected a total 64 wins or 40% of all races. Profiting at Keeneland is all about knowing the tendencies of the individuals that know how to win year-in and year-out at the Lexington racetrack. Click here to learn more about a new handicapping book.